This leads list of cardiologists can pump up your B2B campaign! Find cardiologists with this ready-made, pre-built cardiologist email list from Bookyourdata.com. Keep your finger on the pulse of the industry and get connected with cardiologists at numerous institutions using this professional database. Keep your pharmaceutical or medical marketing campaigns up to date with this accurate cardiologist mailing list containing the sales leads most relevant to your company's products and services. We've collected all of the information you need in this verified cardiologist email database, so you can start marketing to this unique, specialized group of highly qualified, heart-focused doctors, including names, titles, hospital/company information, direct emails, phone numbers, addresses, and much more. By consolidating this diverse group from many medical institutions into one cardiologist email list, business-to-business (B2B) marketing becomes faster and easier. Find all of the information you need and pull this targeted directory seamlessly into your CRM! Then, make contact and start marketing right away with no extra fees. 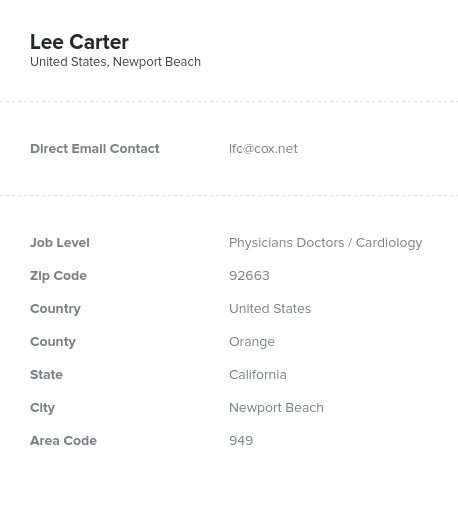 With Bookyourdata.com's premium cardiologist list, finding and connecting with cardiologists really can be simpler. Heart diseases are the top killers in the U.S. and in many other countries. As such, cardiology is a very vital and important specialty. Dealing with diagnosing heart conditions, recommending diet, drug, and exercise regimens, and helping patients suffering from heart attacks, cardiologists have a fairly stressful job while trying to decrease the stress of those around them. If you'd like to email leads about a replacement valve or medical device, a blood pressure or cholesterol drug, or some other heart-relevant product, this affordable cardiologist email list is definitely the mailing list you need to connect. Buy this list, download cardiologist email addresses, and bring new life to your business!